Quick overview This new edition of Olive Stevenson's highly respected text is updated throughout to include the latest policy and research developments, and expanded to include greater consideration of topics such as the impact of parental mental health, substance abuse and alcoholism on parental capacity and the issue of parents with learning disabilities. Those who work with children and young people have a responsibility to safeguard and promote their welfare. Recognizing and detecting signs of emotional abuse and neglect is an important responsibility as well as a key skill. As well as ensuring that children and young people are free from harm, it is equally important to ensure their well-being and quality of life. 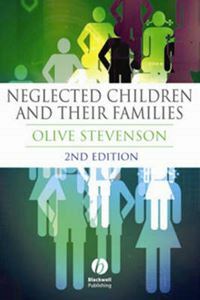 This new edition of Olive Stevenson's highly respected text is updated throughout to include the latest policy and research developments, and expanded to include greater consideration of topics such as the impact of parental mental health, substance abuse and alcoholism on parental capacity and the issue of parents with learning disabilities. Providing clear guidelines for the assessment and intervention of child neglect, Neglected Children and Their Families is an invaluable resource for all those studying and working in childcare, including social workers, health visitors and child nurses.